Do you have a great web design? Awesome! How does your mobile website compare? Many companies have spent time focusing on their website and have given little attention to their mobile design. Why is this important? If you don’t have a rocking mobile web design, then odds are you losing money — and not just from Millenials, we’re talking all across the generational spectrum. According to Total Retail, both age and income play a role in mobile consumer purchasing behavior. They found that 75-percent of Gen Xers and 33-percent of Baby Boomers use their mobile devices to make purchases. Consumers use their mobile devices for comparison shopping, to search reviews, or to multi-task while at work or during their commute. They also use them for loyalty programs and to find coupons and discount codes while out shopping. To take advantage of this growing trend, you want to make sure your company has an inviting mobile design, and potentially, even a mobile app. Create a Linear Journey — Efficiency is key when it comes to mobile design. Consumers need to be able to get in and out quickly. Ensure you are creating a path for them that will fulfill their needs fast. Use predictability in your design and create a flow that is natural and predictable based on consumer behavior. Clean and Neutral Designs — Instead of designing to the max, try to incorporate the theory of Zero UI into your mobile design. Keep things neutral and strip away decorative elements that will distract the user from content or actions you want them to take. Progressive Disclosure — With so much information to share, it can get instantly overwhelming for a user on a mobile device. Instead of showing everything all at once, use progressive design and only display information when it’s needed or asked for. Incorporate Location Awareness — Adding location awareness will make it easier for the consumer to use your mobile app. This way they can quickly order, find discounts and get directions. Remember, it’s all about making it easier and faster for the consumer. Offer Plenty of Help — Today’s consumers expect immediate assistance. Make sure that your mobile offering includes plenty of help. Help can be via chat, clicking a link to immediately call, or offering the ability for them to use voice activate help search. When you’re ready to give your company an advantage, contact SBOS Web Solutions and let us craft a beautifully designed, engaging, and easy to use mobile offering that will let your customers connect with you anytime, anywhere. Wall, S. (2018, March 6). “Browsing, Buying or Both? 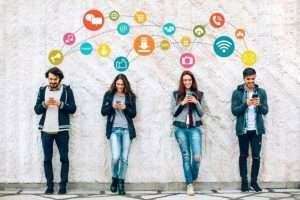 An Analysis of Mobile Shopping Behavior Across Generations.” Retrieved October 20, 2018, from https://www.mytotalretail.com/article/analysis-of-mobile-shopping-behavior-across-generations/. Susan Wall is the vice president of marketing for Oracle Bronto.